Sturdy construction and carry system allows the rucksack to withstand heavy loads. Mid blue interior. Black waterproof exterior. Waist belt with large buckle. 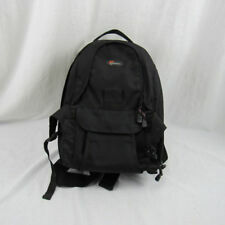 New listingBlack Lowepro Mini Trekker Classic Camera Backpack vgc- please read description. Has a waterproof pull over cover for heavy rain. Well loved and well used Lowepro bag. Lots of marks and a photo pass sticker that bled through and left the ink on the inside. It was a Ricky Ross(lead singer of Deacon Blue) gig if you are wondering. Padded back. 42cm H, 34cm W, 19cm D.
Rezo TLC 10. All in fairly good used condition. Orion Trekker. Located near Whitby YO22. Lowepro Mini Trekker Classic Fotorucksack. Der Zustand ist wie oben beschrieben. Der Rucksack befindet sich in einem guten gebrauchten Zustand. Deshalb erfolgt hier der Verkauf unter Ausschluss jeglicher Gewährleistung. All zippers and velcro function properly and appears to have lots of life left. Hidden Front Pocket. INTERNATIONAL . Ich bin gem. Ihnnenmasse 37 x 30 x 11 cm. Lowepro Mini Trekker AW. Nuestras cada vez más populares Mini Trekker - ahora con un All Weather Cover ™, son ligeras, compactas y tiene una sorprendente cantidad de cambios. Incluye un soporte integrado de liberación rápida para el trípode, los lazos de conexión de accesorios opcionales SlipLock ™, correas de compresión y un montón de bolsillos - incluyendo un gran bolsillo delantero con pestaña y un bolsillo frontal de acceso rápido. Mini Trekker CLASSIC. a mini Trekker Classic. In einem guten Zustand, funktionsfähig. 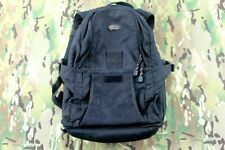 Leichte Gebrauchsspuren auf dem Rucksack. Lowepro Mini Trekker Fotorucksack. Tiefe: (in cm) ca. : 11cm. Innen mit 12 Klettwänden variabel ausfächerbar, 2 Reissverschlussfächer im inneren und eine weitere aussenliegende große Reissverschlussfächer. I BELIEVE THE LENS CASE IS 105 BUT NOT SURE. MISSING VELCRO DIVIDERS . Two lowepro camera bags, one is photo trekker aw backpacks. Another is mini lowepro shoulder/hand camera bag. All in mint condition. When you have an expensive camera, one of the worst things that could happen is that you drop the device when you are trying to transport it from one location to another. As a photographer, you are most likely going to take your camera with you, but carrying it in a bag without padding can be devastating. The Lowepro mini Trekker is a small carry case that is shaped like a backpack, which makes it a durable option that you can use for your camera and that has enough padding to keep it from taking damage if it falls. What are the Lowepro mini Trekker dimensions? A Lowepro mini Trekker is about the size of a backpack. It has space for your camera, your photo accessories, and more. In general, one of these bags will be about 30 centimetres by 40 centimetres, and it will have several straps that you can use to help secure the camera bag to your body so that it does not bounce or break while you are on a trek. A bag this size is going to be able to accommodate 35mm cameras, so if you want a bag that is easy to carry, consider this one. What are the Lowepro mini Trekker specifications and features? Weather flap - This will help protect the bag and your camera from rain and inclement weather. Ergonomic straps - To ensure that you have the support that you need to carry the mini trekker with all of your equipment, you will want a bag with both shoulder straps and a sternum strap. Padded dividers - This will help protect the parts of your camera. It also prevents the camera and the accessories from shifting during your commute. Can the Lowepro mini Trekker be customized? Yes, since there are dividers inside the bag that are designed to protect your camera, you will be able to move the dividers to accommodate your camera's specific dimensions. 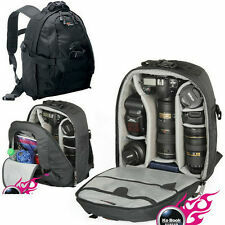 Most of these models have ample space for multiple lenses, so you will be able to carry anything you need for your shoot in a single bag.